Paintless Dent Repair (PDR) is the fastest and most cost effective way to remove small, medium and large dents from motor vehicles. The damaged area of the panel is meticulously massaged out from the backside to its original form. There is no heat, dry ice, suction, or magnetism used to remove the dent. The panels are restored without the use of fillers or paints. The results are nothing shorts of amazing and best of all, you’ll have a blemish free vehicle which has been restored to its original factory finish. Most door ding & dent repairs are completed in less than an hour! As long as the paint has not been broken or cracked. The size of the dent can be as large as a watermelon but if it is too deep the metal may be stretched. Almost all dents can be removed as long as the metal has not been badly kinked or stretched. Dents can be fixed almost anywhere on the vehicle as long as the dent is not located on the very edge of a panel. 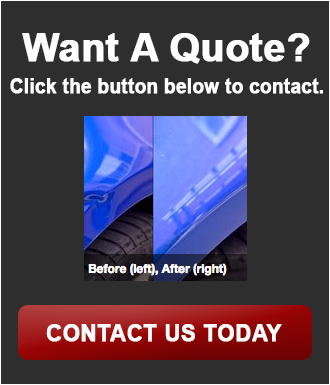 Small to medium size dents and creases in the doors, fenders, or quarter panels. Body shop size dents that have original paint intact. Dents must be seen to determine outcome and price. Go to our contact page to upload a picture of your car. There are some dents, however, that can’t be removed by our method and they are usually on the edge of a panel or over a double braced area. Any such limitations will be discussed completely before the job is started. Paintless Dent Repair is more than a process. It is an art form. Touch up can be performed on small areas where paint has been removed due to the impact of the dented area. Please be advised that touch up is 70% better when completed. If you would like to have this performed please order the touch up paint from the dealership or online. If your bumper has a dent without paint damage we can save you hundreds of dollars over a body shop repair. Using a similar technique to PDR we are able to reshape your bumper and save you money.